Important separate issue map of Chelsea, Manhattan. 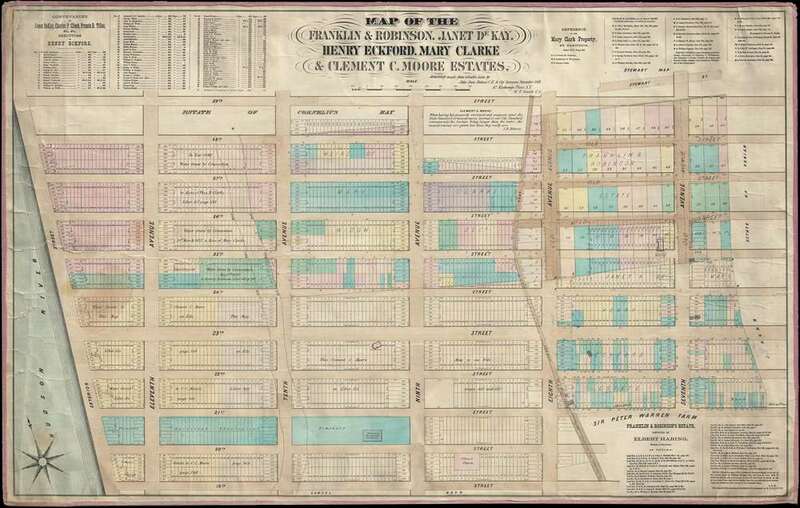 Map of the Franklin and Robinson, Janet De Kay, Henry Eckford, Mary Clarke and Clement C. Moore Estates. A rare and highly detailed separate issue 1869 John Bute Holmes map of the Chelsea neighborhood of Manhattan, New York City. The map covers from the Hudson River to 7th Avenue and from 19th to 29th street. Like all of Holmes' important neighborhood maps, the present map focuses on the mid-19th century breakup of the great Manhattan estates into property lots. In the present example the focuses on the estates of Franklin, Robinson, heiress Janet de Kay (1802 - 1854), shipbuilder Henry Eckford (1775 - 1832), heiress Mary Clarke, and the academic and heir Clement Clarke Moore (1779 - 1863). all that farm or plantation in the Bassau Bowery on the West side of Manhattan Island, bounded on the west by the Hudson River, on the east by land of John Horn, on the north by the land of Widow Cowenhoven and Brandt Schuyer, on the south by land of Sir Peter Warren and Yellis Mandeville. In modern terms, the approximate extant of the estate was from 8th Avenue to the Hudson River from 21st to 24th streets. Here, Clarke built a grand mansion which he named Chelsea, referencing London's Chelsea Hospital, a home for aged veterans, which he in fact was. The lands were eventually broken up among his heirs until the mid-19th century, when the estates were fully broken up and broken into smaller lots to accommodate the Manhattan grid system and rapid urban growth of the city. The estates described in this map, extend along the exterior line, on the North-river, from Nineteenth to Twenty-eighth Streets; thence along the latter Street to the Tenth Avenue; thence to Ninth Avenue seventy-five feet North of Twenty-eighth Street; thence southerly about two hundred feet; thence to the old Fitzroy Road - Twenty-seventh Street near Eighth Avenue; thence, along that old road, nearly to Twenty-ninth Street; thence, easterly, to Twenty-ninth Street, about two hundred feet easterly from the Seventh Avenue; thence nearly parallel with the Seventh Avenue, to Twenty-first Street; thence along the latter Street to the Fitzroy Road near the Eighth Avenue; thence along the Fitzroy Road to Nineteenth Street; and thence, along the latter Street. to the place beginning. This map was issued by John Bute Holmes in 1869. Like all of Holmes' maps, this map was separately issued and is quite rare. The present map is one of only 4 known examples, the others being hold by the New York State Library, the New York Historical Society, and Princeton University. John Bute Holmes (March 31, 1822 - c. 1888) was an Irish civil engineer, city surveyor, and mapmaker based in New York City in the middle to latter 19th century. Holmes' father-in-law supplied funds for him to immigrate to America in 1840 and shortly thereafter, in 1844, he established himself in New York City. He briefly returned to Europe before once again settling in New York City in 1848. Apparently, according to several New York Times articles dating to the 1870s, Holmes was a man of dubious personal and moral character. He was involved in several legal disputes most of which were associated with his outrageous - even by modern standards - womanizing. Holmes seems to have been married to several different women at the same time and to have had an unfortunate attraction to exceptionally young women - one of whom, a girl of 16 who claimed to be his wife, sued him for 50,000 USD. On another occasion he was found guilty of killing Brooklyn policeman David Gourly with whose wife he "had been intimate." Despite his legal issues, Holmes was rumored to be a man of considerable means, with a personal fortune estimated between 100,000 and 500,000 USD - a significant sum in the late 19th century. His reputed wealth may or may not have derived from a serious of 21 important maps produced between 1867 and 1875 illustrating various New York City neighborhoods. Very good. Minor tallow stains, left side. Original linen backing and edging.